UPDATE: Was Anna Murray Douglass still buried in DC when Frederick Douglass died in 1895? 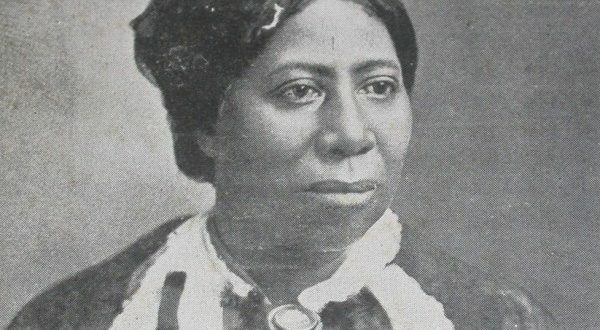 A couple days ago I posted a clipping from the Baltimore Sun indicating Anna Murray Douglass was buried in Graceland Cemetery within days of her death on August 4, 1882. I then called the clerk of Mount Hope Cemetery who told me their records indicate Anna Murray Douglass was buried there in 1882, but didn’t have the exact date of her internment. Fair enough. A friend and a reader have since sent an article I’d overlooked from February 22, 1895 revealing that upon Frederick’s death in Washington in February 1895, his children intended to “disinter” Anna, who was still buried in DC, now at Glenwood Cemetery (as Graceland Cemetery closed in July 1894), and move her to Rochester to rest alongside Frederick, and their youngest daughter, Annie. I called over to Glenwood Cemetery on Lincoln Road NE and spoke with Walter, the superintendent. I explained all the background and said I was trying to get to the bottom of this mystery. Ever gracious Walter gave a thorough once-over through the card files and internment book from 1894 until 1896. This would have covered Anna’s possible move from Graceland and/or her disinterment, right Well, Walter didn’t see anything but extended the invitation to come over and check the books out in person, if I’d like. What I find interesting is, that if Anna Murray Douglass was moved from Graceland to Glenwood, she was moved to what Richardson calls one of the city’s “big five” white cemeteries of the last nineteenth/early 20th century. Those five being, Oak Hill, Rock Creek, Congressional, Glenwood, and Mount Olivet, which was a biracial burial ground. The “big five” of Washington’s black cemeteries of this time, Richardson writes, were Harmony, Payne’s (east of the river), Mount Olivet, Mount Zion, and Mount Pleasant. Now, back to Mount Hope. The New York Times clipping must be read with a certain level of critical perspicacity. At the time of Frederick’s death in 1895, Rosetta, his oldest daughter, was alive, but his youngest daughter Annie, had been dead for thirty-five years. 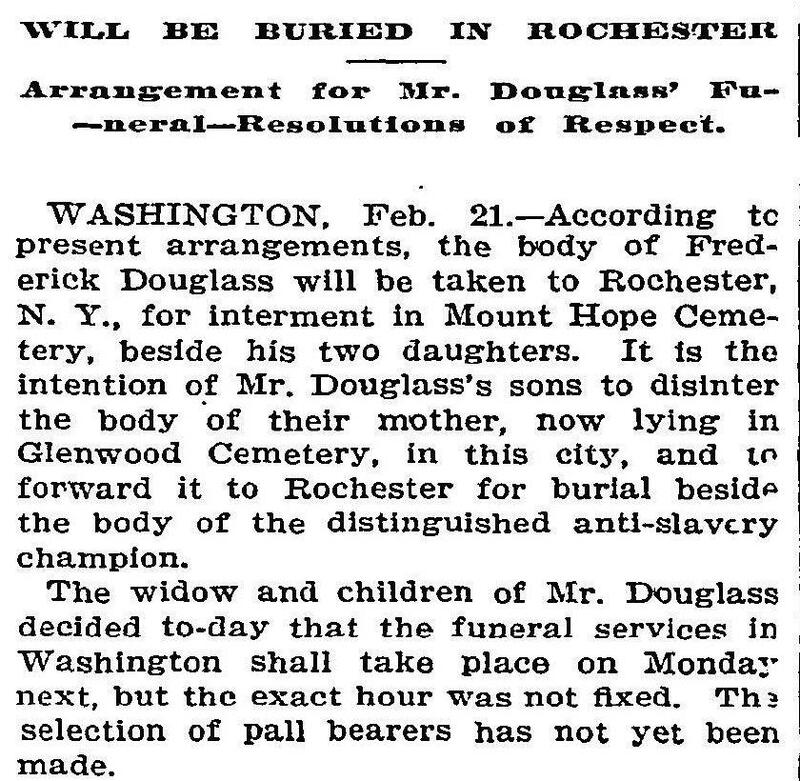 So, only one of Douglass’ daughters was buried in Rochester, not two. Calling Mount Hope I spoke with Lydia Sanchez, a clerk at Mount Hope Cemetery which is run by the city of Rochester. I explained Lydia my quandary. Once again, Lydia confirmed that according to Mount Hope’s records Anna Murray Douglass was buried in 1882. It wasn’t until 1888 that datebooks of burials were kept. With this info, is it correct to say that if Anna Murray Douglass was buried in Mount Hope in late February or early March 1895 alongside her husband of 44 years there would be an exact date. I have a whole collection of newspaper accounts of Douglass’s funeral service in DC and Rochester and his subsequent burial in Rochester that I can examine as well as letters. This is not something I had expected to find, but it’s been found nonetheless. Foner, Quarles, and McFeely don’t really get into detail about Anna’s death and burial. Deadrich in Love Across Color Lines does go there, stating that Anna was brought to Rochester and buried there right after her death. Her citation does nothing to prove her claim. While Douglass’ other biographers didn’t step up to bat on this one, Diedrich did. But she struck out. My main man, Frederic May Holland, and his blasphemously ignored work 19th century work on Douglass, may come the closest to to giving some valuable clues to solving his mystery. Will look into this further and get up another post. To be continued….